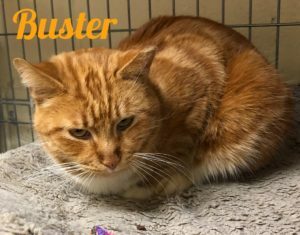 Buster is a delightful orange tabby male, born 1/16/17. He was rescued after being dumped at a store in Selden. Lovable Buster is now ready for a real forever home with someone who will cherish him. Could that be you? Come meet sweet Buster and make his dreams come true! This entry was posted in Adopted, Adult, Cats, Male, Wantagh Adoption Center. Bookmark the permalink.